Bankruptcy asset sales of used leathers. Make your bid! Do you have a tannery and are you looking for cheap stock? Register to Industrial Discount and find out every day the best deals on used leathers! We are an international auctioneer specialized in the sale of industrial machinery and equipment from bankruptcy procedures; that is why we are able to offer you the lowest prices on the market. Cheapness, but not only that. Online auctions, compared to traditional auctions, offer many other advantages: leaner procedures, real-time access, faster purchasing times. You will no longer need to travel to carry out your investment, on Industrial Discount you have all the information you need at your fingertips! To attend the online auctions, you must be registered. Registration is free and allows you to have access to all sale documents. To make your bid, you can enter the amount manually or set up the Proxy Bid, the automatic bidding system which raises your bids on your behalf, according to the maximum price you set. At any time, you can check sale trends and monitor in real time the bidding activity on your favorite items, all through the Watchlist feature in your account. To be able to meet the needs of any type of company, from small to medium-sized companies to large multinationals, we have decided to structure sales in two stages: during the first stage, you can bid on individual assets; during the second stage, which lasts about 10 minutes, you can bid on the entire set of items of the procedure. If no bid is made during the second stage, the winners of the first one will be confirmed. Find the best used leathers and leather equipment at the cheapest price on Industrial Discont, make your offer now! 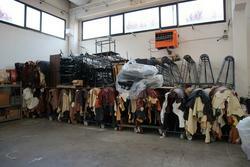 Do you want to stay updated about the upcoming auctions of used leather equipment? Subscribe to our newsletter! You will receive a weekly email showing new items for sale.